with phase separation of Al-Ni rich and Cr-Fe rich phases in the as-cast FeCoCrNiAl alloy. ..... Ranganathan S (2003) Alloyed pleasures: multimetallic cocktails. 2.6 Determining Seebeck Coefficient and Electrical Conductivity . ..... introduces local variation in the density of states (DOS) near or within the band gap region ..... technology capable of processing conductive and nonconductive materials. INTRODUCTION Recently, multi-component equiatomic alloys, which is also referred to as high entropy alloys in the literature, receive a great attention as a new type of materials (Cantor et al., 2004; Yeh et al., 2004; Tong et al., 2005b; Tung et al., 2007; Lin & Tsai, 2011). They are defined as a solid solution of five or more elements, and the amount of each element is ideally balanced, i.e., from 5 to 35 at% in the case of five elements. Besides the high entropy due to near-equal atomic content in the multi-component system, another requirement for the definition of high entropy alloys is the small difference in atomic radii of the constituent elements (Yang & Zhang, 2012). It has been shown that the high-entropy alloys exhibit high mixing entropy, lattice distortion, sluggish diffusion and cocktail effect. 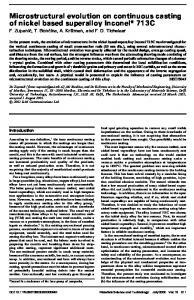 They provide high-entropy alloys with a wide spectrum of microstructure and properties, indicating that these alloys have great potentials in many applications such as tools, molds, dies and mechanical parts (Yeh et al., 2004). MATERIALS AND METHODS CuCrFeNi, CuCrFeNiMn, and CuCrFeNiMnAl alloy ingots were alloyed from high-purity elements using arc melting in water-cooled molds under argon atmosphere. The ingots were re-melted at least three times to improve their chemical homogeneity. The nominal chemical compositions are listed in Table 1. 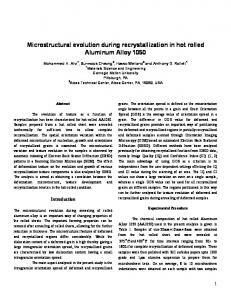 To investigate the effect of cooling rate on the microstructure evolution, the alloy ingots were remelted, and poured into the conical cylinder-type mold. The microstructure of the specimens cut at the at the diameters of 6 and 12 mm were compared after polishing and etching. The specimens were observed under a scanning electron microscope (SEM, JSM-7001F; JEOL, Japan). The chemical composition of the phases in these alloys was analyzed by energy dispersive spectrometry (EDS, 51-ADD0069; Oxford Instruments, UK) assembled in SEM. X-ray diffractometer (XRD, Ultima IV; Rigaku, Japan) with Cu Kα radiation for a 2θ range of 20o to 80o at a speed of 4o/min was used for identification of the crystalline structures in the alloys. Detailed microstructural investigations were carried out with a transmission electron microscope (TEM, JEM-2100F; JEOL). The TEM samples were prepared by using an ion milling equipment (PIPS, Model 691; Gatan, USA). Fig. 1. X-ray diffractometer patterns obtained from the as-cast CuCrFeNi (a) and CuCrFeNiMn (b) alloys. Fig. 2. Scanning electron microscope images obtained from the as-cast CuCrFeNi (A) and CuCrFeNiMn (B) alloys together with the energy dispersive spectrometry result from the constituent phases. Fig. 3. (A) Bright field transmission electron microscope (BF TEM) micrograph obtained from the as-cast CuCrFeNiMn alloy together with the compositions from each grain marked 1, 2, and 3. (B, C) Selected area diffraction patterns (SADPs) obtained from grain 1 and 3, respectively. (D) Identification of the X-ray diffractometer pattern shown in Fig. 1(b). (E) Magnified BF TEM image obtained from the grain marked as 3 in Fig. 3A together with the energy dispersive spectrometry result. (F) SADP taken from the area marked as 2 in Fig. 3E. Fig. 4. X-ray diffractometer pattern obtained from the cast CuCrFeNiMn alloy after heat treatment for 48 hours at 900oC (a) and 1,000oC (b). fcc phase with different lattice parameter (fcc1: 0.366 nm, fcc2: 0.361 nm). Therefore, the XRD pattern shown in Fig. 1(b) can be indexed as shown in Fig. 3D. Fig. 3E shows the magnified BF TEM image obtained from the grain marked as 2 in Fig. 3A. As shown in the EDS result, the composition of the area marked as 1 in Fig. 3E was 17.4% Cr-24.9% Mn14.3% Fe-32.4% Ni-11.0% Cu, while that of the area marked as 2 was 45.9% Cr-9.9% Mn-30.9% Fe-10.4% Ni-3.0% Cu, indicating that the rod-shaped fcc phase is embedded in the bcc phase matrix. The SADP taken from the area marked as 2 in Fig. 3E which was indexed as  zone. Fig. 5. Scanning electron microscope image obtained from the cast CuCrFeNiMn alloy after heat treatment for 48 hours at 900oC (A) and 1,000oC (B). Fig. 1; however, after heat treatment at 900oC, the intensity of the diffraction peaks from the bcc phase significantly reduced, and new diffraction peaks which were indexed as σ phase appeared. Fig. 5 compares the SEM image obtained from the cast CuCrFeNiMn alloy after heat treatment at 900oC and 1,000oC for 48 hours. The SEM image in Fig. 5A shows that σ phase forms around the dendritic phase by provision of Cr and Fe from the bcc phase after heat treatment at 900oC. As a result, (Cu, Mn, Ni)-rich phase of which the composition is similar to the interdendritic phase. The composition of the area marked as 1 and 2 were 4.3% Cr-25.4% Mn-8.2% Fe24.2% Ni-38.0% and 42.0% Cr-11.8% Mn-34.6% Fe-10.2% Ni-1.4% Cu, respectively. On the other hand, the sample heat treated at 1,000oC exhibits almost same microstructure as in the as-cast state shown in Fig. 2. The EDS result also shows same trend as shown in Fig. 2, i.e., the composition of light, gray and dark contrast regions were 5.9% Cr-24.3% Mn-9.9% Fe-22.6% Ni-37.4% Cu, 19.3% Cr-17.6% Mn-29.9% Fe24.1% Ni-9.0% Cu and 54.1% Cr-9.2% Mn-29.3% Fe-6.4% Ni-1.1% Cu, respectively, conforming the presence of same phases in the as-cast state. As shown in the phase diagram of Fe-Mn-Cu system calculated using Pandat program (Fig. 6), it is expected that the alloy at 1,000oC may be at (fcc+liquid) or (fcc1+fcc2+liquid) phase region, and the liquid may solidified in the bcc or (bcc+fcc) phase during cooling from 1,000oC. At 900oC, the sample is in solid state, and σ phase which may be a thermodynamically stable phase at this temperature appears instead of the bcc phase. Fig. 6. Fe-Mn-Cu ternary phase diagram using Pandat program. Fig. 7. X-ray diffractometer patterns obtained from the as-cast CuCrFeNiMn (a, b) and CuCrFeNiMnAl (c, d) alloys. (a) and (c) were obtained from the section with 12 mm diameter (top section), and (b) and (d) were from the section with 6 mm diameter (bottom section). Fig. 8. Scanning electron microscope image obtained from the as-cast CuCrFeNiMnAl alloy together with the energy dispersive spectrometry result. Fig. 9. Scanning electron microscope images obtained from top (A) and bottom (B) sections of the CuCrFeNiMnAl alloy. depending on the cooling rate. but fcc1 and fcc2 phase are present in the interdendritic region. (3) The heat treatment of the cast CuCrFeNiMn alloy results in the different type of microstructure depending on the heat treatment temperature. The alloy is maintained as solid state during annealing at 900oC for 48 hours, and new thermodynamically stable phase appears instead of the bcc solid solution phase. However, after annealing at 1,000oC for 48 hours, the microstructure is almost same as that in the as-cast state. (4) The addition of Al in CuCrFeNiMn alloy changes the constituent phases from (fcc1+fcc2+bcc) to (bcc1+bcc2) where typical compositions of bcc1 and bcc2 are 10.5% Al-20.9% Cr-15.3% Mn-23.2% Fe-18.0% Ni-12.2% Cu, and 22.8% Al-3.6% Cr-15.0% Mn-5.6% Fe-20.4% Ni32.7% Cu, respectively. 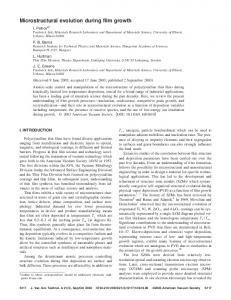 REFERENCES Cantor B, Chang I T H, Knight P, and Vincent A J B (2004) Microstructural development in equiatomic multicomponent alloys. Mater. Sci. Eng. A 375, 213-218. Huang P K, Yeh J W, Shun T T, and Chen S K (2004) Multi-principalelement alloys with improved oxidation and wear resistance for thermal spray coating. Adv. Eng. Mater. 6, 74-78. Lin C M and Tsai H L (2011) Evolution of microstructure, hardness, and corrosion properties of high-entropy Al(0.5)CoCrFeNi alloy. Intermetallics 19, 288-294.
high-entropy alloy system with multiprincipal elements. Metall. Mater. Trans. A 36, 881-893. Tung C C, Yeh J W, Shun T T, Chen S K, Huang Y S, and Chen H C (2007) On the elemental effect of AlCoCrCuFeNi high-entropy alloy system. Mater. Lett. 61, 1-5. Wang F J and Zhang Y (2008) Effect of Co addition on crystal structure and mechanical properties of Ti0.5CrFeNiAlCo high entropy alloy. Mater. Sci. Eng. A 496, 214-216. Ren B, Liu Z X, Cai B, Wang M X, and Shi L (2012) Aging behavior of a CuCr2Fe2NiMn high-entropy alloy. Mater. Design 33, 121-126. 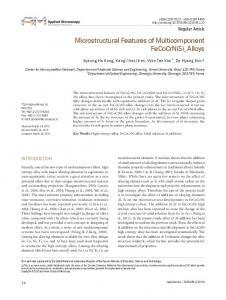 Wang X F, Zhang Y, Qiao Y, and Chen G L (2007) Novel microstructure and properties of multicomponent CoCrCuFeNiTix alloys. Intermetallics 15, 357-362. 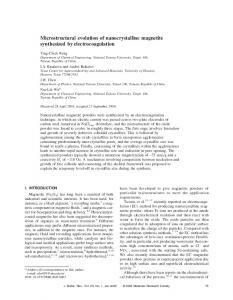 Ren B, Liu Z X, Li D M, Shi L, Cai B, and Wang M X (2010) Effect of elemental interaction on microstructure of CuCrFeNiMn high entropy alloy system. J. Alloys Compd. 493, 148-153. 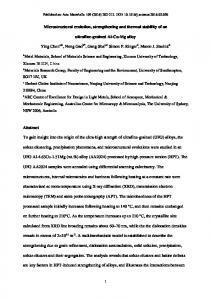 Yang X and Zhang Y (2012) Prediction of high-entropy stabilized solidsolution in multi-component alloys. Mater. Chem. Phys. 132, 233238. Shun T T, Hung C H, and Lee C F (2010) Formation of ordered/disordered nanoparticles in FCC high entropy alloys. J. Alloys Compd. 493, 105109. 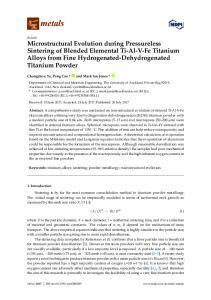 Yeh J W, Chen S K, Lin S J, Gan J Y, Chin T S, Shun T T, Tsau C H, and Chang S Y (2004) Nanostructured high-entropy alloys with multiple principal elements: novel alloy design concepts and outcomes. Adv. Eng. Mater. 6, 299-303. Yeh J W, Chen Y L, Lin S J, and Chen S K (2007) High-entropy alloys-a new era of exploitation. Mater. Sci. Forum 560, 1-9. Zhou Y J, Zhang Y, Wang Y L, and Chen G L (2007) Solid solution alloys of AlCoCrFeNiTix with excellent room-temperature mechanical properties. Appl. Phys. Lett. 90, 181904. 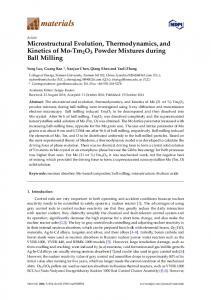 Zhu J M, Fu H M, Zhang H F, Wang A M, Li H, and Hu Z Q (2010) Synthesis and properties of multiprincipal component AlCoCrFeNiSix alloys. Mater. Sci. Eng. A 527, 7210-7214. 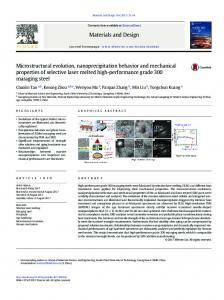 Report "Microstructural Evolution in CuCrFeNi, CuCrFeNiMn ... - ScienceCentral"